This is a multiple database search. We'll be looking for worldly goods. This compilation report is unmatched for comprehensiveness! It has been developed to collect information about an individual's real property, like land, homes, automobiles, vessels and aircraft. Deed transfer records are thoroughly researched. Resources in the name of a company your subject owns, or is connected to, will likely be revealed. 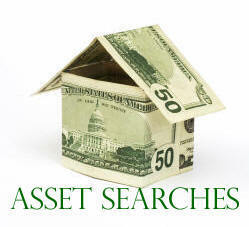 Conduct an assets search before suing to ascertain what belongings and income subject has - to make sure the property will be available, should you win a judgment. Conduct this investigation before taking possession of the goods - such as an automobile or a boat, which could have a lien against it, and you may be liable for the lien. If the person doesn't have anything, why waste your time and money in court? If you're not going to collect, why bother to go through the hassle of a court conflict (not to mention the expense), to get a judgment? Our Research Specialists check all obtainable ownership records. This multiple database report that hunts for worldly goods is unmatched for comprehensiveness!